What makes something an antique? Time or allure? Last summer my mother and I visited a family friend in Nantes. Nantes had just spent millions and millions of euros to create a robotic elephant that, to my mind, seemed like an antique. The richness of the mohagany wood and the slow, deliberate movements of the elephant made me think the creators, Les machines de l’ile, had recently unearthed a previously unknown Da Vinci creation. While touring the Olson Sundberg Kundig Allen (OSKA) studio, based within an old shoe factory in Seattle, I had the same reaction. Their work, however recent, seems to me timeless and somehow antique. it could have been the sturdy yet worn wooden boxes that tom kundig’s model sat on, or the allure of the top floor office in an old factory building, but something about oska is esoteric, and yet somehow comforting. exactly like an antique. climbing up to the top floor of the factory, i felt like i was sneaking into the attic of an eccentric neighbor to spy on his inventions. busy bodies rushed by as i was greeted by my tour guide, drew, who went to architecture school in louisiana like me. drew first led me to what oska calls shoe box one and two – meeting spaces for staff. the doors to each room were notched out of large, rotating walls. everything moved slowly and deliberately. smooth and exact. we then moved on to the next tour destination, a skylight. drew calmly pointed out the coolest architectural feature i’ve seen in a while. grasping the knobs of two rotating circular handles and pulling them in opposing directions, drew explained matter of factly what was about to happen. water, pressured only by the city, slowly filled the two five-foot pistons set on either side of the skylight window frame. the steel frame skylight, which had to have been 15×30, slowly opened up, greeting a blue seattle sky; simultaneously the air conditioning in the office shut off, wasting no energy. this massive window had just been opened solely by the city’s water pressure. “if you open the windows a crack you’ll get an amazing breeze flowing through the office,” said drew. for a moment i could imagine it. He cranked the knobs back toward each other and the whooshing sound of water jettisoning out of the pistons filled the space. “the water from the pistons feeds into a garden on the roof,” drew explained – a perfect mix of imagination and respect for nature. nothing wasted. tom kundig designed the skylight window with the help of relatively unknown engineer, phil turner. many of the intricate engineering innovations in tom’s projects are the result of collaboration between kundig and turner. rolling huts must be my favorite kundig project. there is a degree of fantasy and practicality at play that makes these huts seem both familiar and ancient; his movable huts feel like the archeological remains of an old nomadic tribe that had wandered the Idaho valleys. but there is also a quality that makes these visitor huts feel expensive, and therefore unattainable. it’s as if these huts were designed by glenn murcuttfor the wealthiest aboriginal family, rather than his usual clients regular impoverished aborigines. there is nothing philanthropic at play here. rolling huts’ is pure indulgence. i was somewhat amused to learn that the huts had to be movable, based upon a stipulation for purchasing the old r.v. campground. despite the expensiveness, the huts still host an underlying appreciation for nature – the owner plans on restoring the site to its original meadow state. respecting nature is an important facet of oska’s work, and has remained a central core value since the beginning of the firm. jim olson started the firm in 1966, a time when people likewilliam o. douglas, rachel carson, and were standing up for nature and bringing abuse of nature to light. 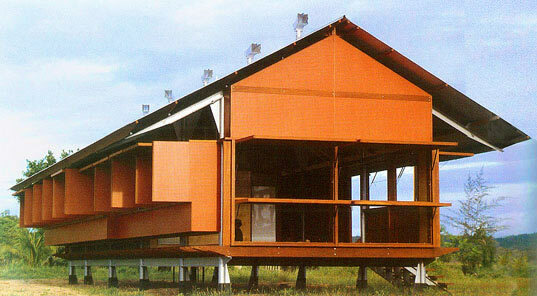 quite possibly my favorite project done by oska was olson’s earth house, constructed in 1968. It has the feeling of an old temple tucked into nature. a building overgrown by nature’s course. yet, it is still a very refined and elegantly design space. there is nothing shabby or decrepit about earth house. kundig and olson’s design seemed at first very peculiar different to me. but as i followed drew around the office i began to understand their connection. it’s a matter of antiquity and understanding the materials being used. kundig might be much more whimsical in his gestures and explorations of engineering marvels, but they both (along with rick sundberg ) have a strong understanding of the materials they employ. towards the end of the tour i asked drew what sorts of projects oska was exploring now and how they were coping with the current construction environment. i was elated to hear that they were having weekly meetings to explore ways of maintaining their high level of design while transitioning to less high end projects. there is something endearing about this; i can’t wait to see what kinds of trinkets they will create for more philanthropic projects. drew and i wrapped up our conversation after looking over several beautiful and delicate models of past projects. as i walked towards the elevator, a woman who has been working at the firm for 15 years picked up a wheel laying on the floor. “whose wheel is this? is this yours?” she asked, looking at me. it seemed like a fitting end.